Hi, it’s video Friday and I have a wonderful project for you today but before I get into that I wanted to share with you a little bit of Stampin’ Up! excitement. The new 2015 catalog is now released for distribution and I have a few being shipped to me. I am only giving an advanced copy to those people who purchase from me this month. June 1 I will be adding a PDF file to this site so you can download it for free there. Now get ready for some craftiness. This hexagon box was a bit more difficult than I had intentionally planned it to be but in the end it turned out really cute. As I said in the video, I did have a few takes of this project and ended up having to swap out part of the project for steps that I had did off camera. I really want my tutorials to be somewhat quick. For the first 3 people who comment (nicely) I will send a hexagon box. Free of charge! Gotta love freebie’s! Score on the short side at the 2, 4 and 5 1/4 inch mark. Score on the long side at the 1 3/4, 3 1/2, 5 1/4. 7, 8 3/4 and 10 1/2 inch mark. Score from the top to the small score line and press a “notch” at the 7/8, 2 5/8, 4 3/8, 6 1/8, 7 7/8 and 9 5/8 inch mark. 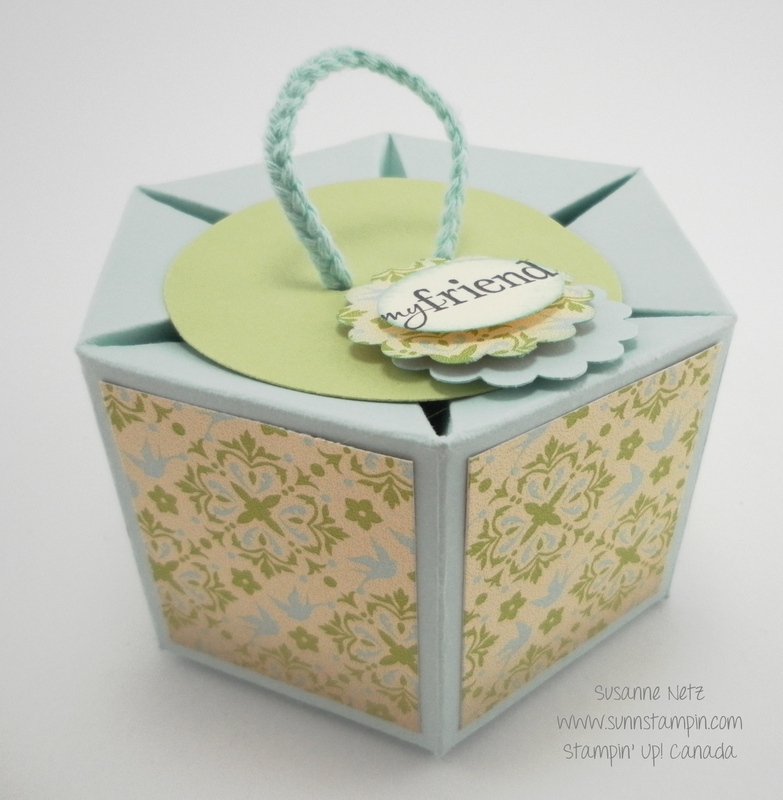 This entry was posted in Fabricate Friday on May 2, 2014 by Susanne.